Which hospital do you volunteer at? 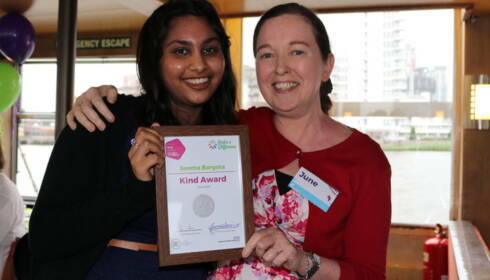 How long have you been volunteering with Imperial Health Charity? I mainly volunteer in the Friends Shop in the Queen Elizabeth the Queen Mother building, although I have a number of other roles directly supporting the Friends charity including membership secretary and supporting cake/book sales. How did you get in to volunteering here? I was in business for many years and when I retired I wanted to do something worthwhile and volunteering at St Mary’s Hospital seemed ideal. I love spending time with my family, I enjoy going to the theatre, cinema and art galleries too. What would you say to someone considering volunteering at one of our hospitals? Definitely do it. It gives you more than it takes. If you were on a desert island, what disc, book, and food would you take? My disc would be Rod Stewart’s The Great American Songbook. I love those old songs — they bring back many happy memories. My book would be How to Survive on a Desert Island. Food is a problem as I like so many things but I would definitely like to take my medication and hope to find food on the island. 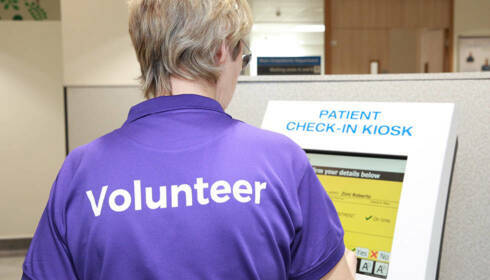 What do you think is the main difference you make as a volunteer within the hospital? I’d like to think that I take some of the pressure off staff on days when I volunteer. Our clinics are always extremely busy and I try to do anything that allows the nurses and healthcare assistants to spend more time with their patients. What drew you into volunteering with us? I was treated at The Western Eye and witnessed the dedication of staff first-hand. I thought if I could help in any way, I might be able to repay the kindness and care. What is your favourite thing about volunteering with us? I love being able to help — both patients and hospital staff, it is a very satisfying way to spend a day. What have you learnt whilst volunteering? I've learned that there are an awful lot of things that can go wrong with your eyes. I've also learned that I could never be a nurse or a doctor… their patience is amazing. I love to travel, I don't think I travel enough. There is so much to see and so much to learn. Do it. Volunteering is so much more rewarding than working ever was! Even a couple of hours a week is so appreciated. Every time I leave the hospital, someone thanks me for coming in and I don’t think anyone ever did that when I worked! What are your main tasks as a volunteer? Being there for patients, listening to them, being here to chat — sometimes patients want to talk about anything, not always about their treatment. I look out books and leaflets for the patients if they ask and make cups of tea and coffee. I try to be as useful as I can be. What do you think is the main difference you make as a volunteer within a hospital? Patients are pleased to talk to someone here not involved with their treatment. Today I was speaking in Italian to a lady who had just been for her treatment — when she left she said she felt relieved now, she felt it was good for her to have some tea and a chat before she left. I had some help when I had cancer and I just want to give something back now. To show others some hope and provide positivity. What you give to life, life gives you back three times more. With a little time you can make a big difference. Disc: Ambient music; book: Greek mythology; food: lasagne. Supporting the medical and nursing staff in the smooth running of the prostate cancer clinic. A point of reference to patients at a very stressful time for them. Helping staff with various tasks so they can get on with their medical and nursing duties. Why did you start volunteering with us? I am a surviving cancer patient and have been there and done it, so I can relate to the anxieties and stress, for both the patients and their supporters. Working with a close-knit, professional, conscientious and caring team. Being part of a large volunteer group who all care and always give their best for the hospital. That having someone be there is a great support at a difficult time, for patients and partners/parents/children and carers. Patience and always be in good humour. Keep doing all things to the best of your ability. Having been given the all-clear after my cancer treatment, I did something that I had always wanted to do — I qualified as a scuba diver and became an assistant instructor. If you were on a desert island, what CD, book and food would you take? CD: The Essential Robert Johnson; book: Catch 22 by Joseph Heller; food: spices so that I could cook any Keralan food, especially a crab curry.